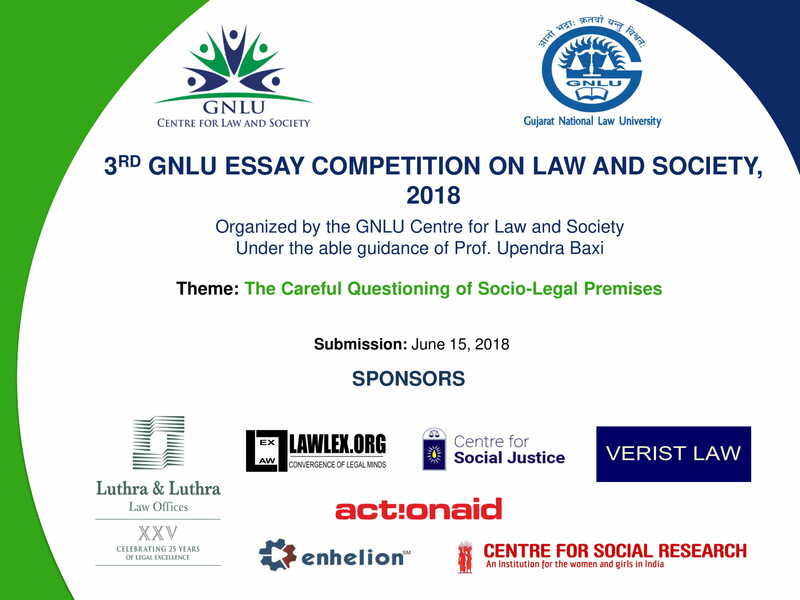 The Centre for Law and Society, Gujarat National Law University has great pleasure in announcing the 3rd edition of the GNLU Essay Competition on Law and Society, 2018, a national-level essay competition being organized under the able guidance of Prof. Upendra Baxi. In recent times, the Supreme Court of India has passed numerous decisions having momentous social, economic and political ramifications. Drawing from historical, philosophical, political, sociological and economic sources, legal interpretation is no longer practiced as a static affair, but has led to passing of judgments which are pertinent, relevant and effective. This has led to the question as to whether usage of social tools or realities is an accepted method of interpreting the Constitution and statutory provisions. Development of jurisprudence along these lines necessitates socio-legal analysis of judicial developments to assess the methodology used, the alleged overstepping of the Apex Court’s role under the scheme of separation of powers and the relevance of the interpretation or policy laid down by the Court. Eligibility: The competition is open to all undergraduate and postgraduate students enrolled in any discipline in a recognized University/ College/ Institute in India. Prizes: Cash Prizes up to INR 30,000 are up for grabs. Winners will also be offered internships by Luthra & Luthra Law Offices, Verist Law Offices, LawLex, Centre for Social Research, ActionAid and Centre for Social Justice. They will also be offered Certificate Courses of their choosing out of the specified courses offered by Enhelion. Certificates will be issued to all participants and winners.